Thanks to record amounts of rain hitting northern Colorado in September of 2013, the rivers along the front range grew from small streams and rivers to roaring torrents. The heavy water flow built over several days and cumulated with the rivers overflowing their banks and hurling debris downstream. Below are some photos that I took from Bear Creek Lake. It shows some of the flooding that hit Evergreen and flowed through the town of Morrison. The dam at Bear Creek Lake was one of three built to help protect Denver from flooding. 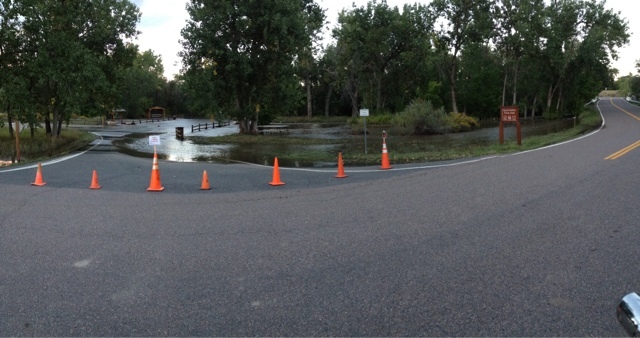 Cherry Creek State Park and Chatfield State Park also were built to contain potentially damaging flood waters from overwhelming the city of Denver. Based on the amount of water that was at the lake, I would say that the dam did the job it was designed for. The water level rose dramatically over the average height, but output towards Denver was closely managed and released at a level that reduced the chances of flooding. Flooding at Skunk Hollow Picnic area, Bear Creek Lake. Bear Creek Lake flooding from Pelican Point. These photos were taken with an iPhone 4s in panoramic mode.